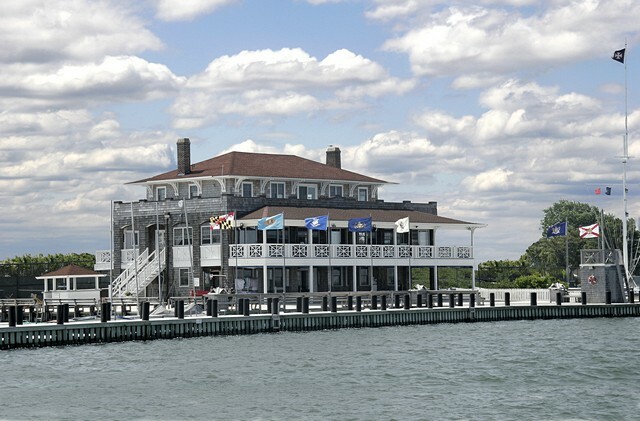 The second weekend of August brings the annual invitational Downbay Regatta to the sailing grounds of Little Egg Harbor Bay behind Long Beach Island. 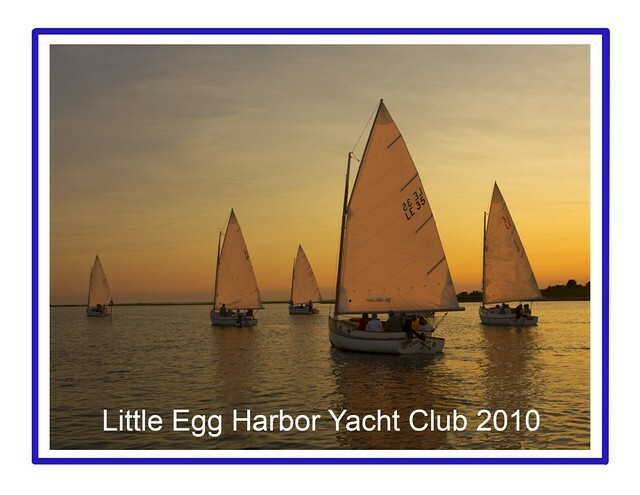 This always exciting premier sailing and social event has been hosted by the Little Egg Harbor Yacht Club for many years. 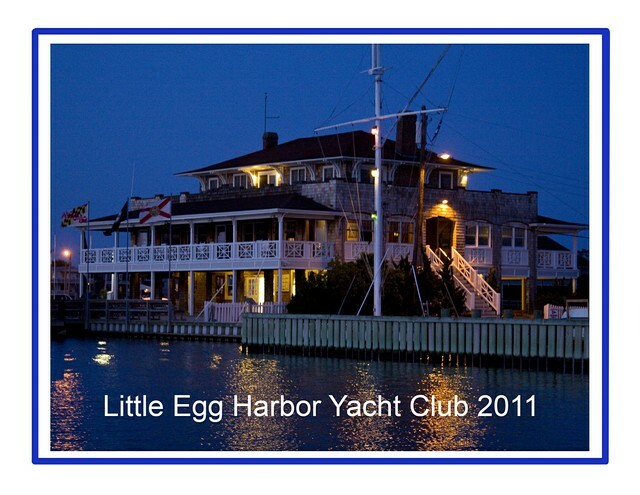 Guest clubs are from along the upper Barnegat Bay sailing area, ranging from Island Heights to Bayhead. There is a social overlay but there’s also a day and a half of hard, competitive sailing amongst four fleets, the large A-cats, the more traditional B-cats, the sleek, racy E-scows, and the supple Lightnings. Above is a group of E-scows, spinnakers out and rails in the water. It is an eye-festival of color and motion. When the scows are approaching their marks it can become dangerously crowded. Here is some crude video to give you a sense of the sound and motion of the scene. Don’t be too harsh on me; I was shooting from my inner tube. For many the queens of the regatta are the big A-cats. These are characterized by a single mast carried well forward in the bow of the boat, a centerboard, a long boom providing plenty of sail, a wide beam approximately half the length of the boat, a single sail, and a “barndoor” rudder. Evolving in the late 19th century they were used for fishing and transport in the coastal waters around Cape Cod, Narragansett Bay, New York and New Jersey. 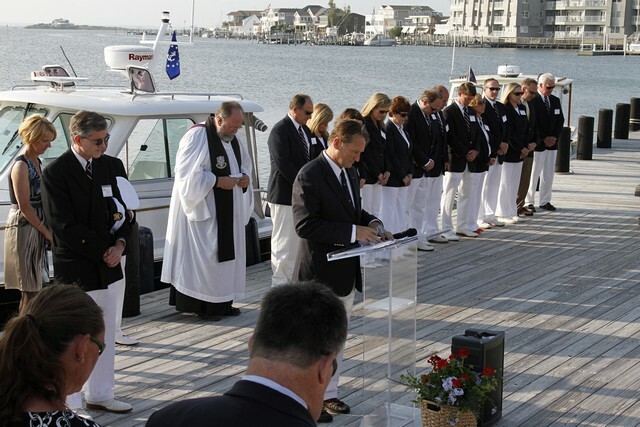 Their shallow draft was particularly good for Barnegat Bay waters and, with their wide hulls providing lots of carriage space, they proved to be a great work and transportation boat. The A designation was created in 1923 for a larger recreational boat design that would carry five to ten people during racing. Here are four of the five that joined us this year, Spy, Spyder, Torch and Vapor. They’re dramatic boats under sail, especially when headed downwind. 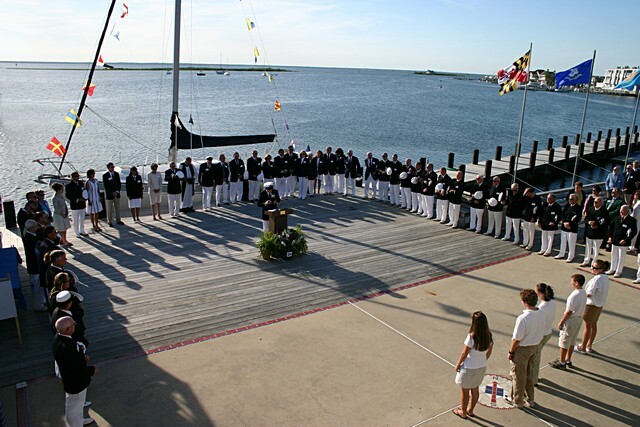 A backbone fleet of our club is that of the more traditional catboats, sometimes referred to as B-cats. They’re smaller but can be handled by one for a pleasant evening sail. Here, four of them are about to make their turn at the mark. Another fleet that was well represented was that of the Lightning class. Handsome, here, as they race downwind with their colorful spinnakers. Our family participated again this year. Last year granddaughter Gretchen crewed on one of the E-scows. This year she and granddaughter Maddie sailed a friend’s catboat with their friend and sailing colleague Sam as captain . Also, daughter Sigrid got to ride on one of the A-cats, Spyder, captained by a high school friend, Tim. who invited her to fill in on Sunday. That’s Tim on the bow and Sigrid on the rail at his left. An interesting series of pictures on the construction of Spyder can be seen by clicking here. For some more snapshots of the weekend, click here.